What Kind of Soil Do Orange Trees Like? Native to northeastern India, sweet oranges (Citrus sinensis) will grow in a variety of soils as long as they drain well and are slightly acidic. Plant nutrients in the soil where orange trees are planted are depleted quickly, requiring regular applications of fertilizer. In Florida, orange trees typically grow in well-drained, sandy soil. California orange trees grow in deep loam. Orange trees will not thrive in heavy clay and other poorly drained soils. Before planting an orange tree in sandy or clay soil, rototill a 1- to 2-inch layer of good quality soil or compost in a 5- by 5-foot area. Before planting in heavy clay soil, create a mound or raised bed before adding the soil or compost. If the water table is less than 30 inches below the soil, both root growth and yields of orange trees will be low. Orange trees like a slightly acidic soil with a pH between 5.5 and 6.5. You can buy a kit to test soil pH in most garden centers. A soil pH of 7 is considered neutral and anything above that is alkaline. Granular or lime pellets are easiest to raise pH levels and do not require masks. To increase soil pH before planting an orange tree, work 5 to 10 pounds of lime into the top 6 inches of per 100 square feet of soil. Work 5 pounds of lime into the top 6 inches around established trees. Test the soil again in three to six months to see if your soil is in the optimal range. Lowering soil pH with sulfur takes longer than increasing it with lime, and it is difficult to lower extreme alkaline soil to a pH level suitable for orange trees. If your soil pH is 7, you can lower it to 6.5 by incorporating 3/5 of a pound of aluminum sulfate for every 10 square feet of soil. 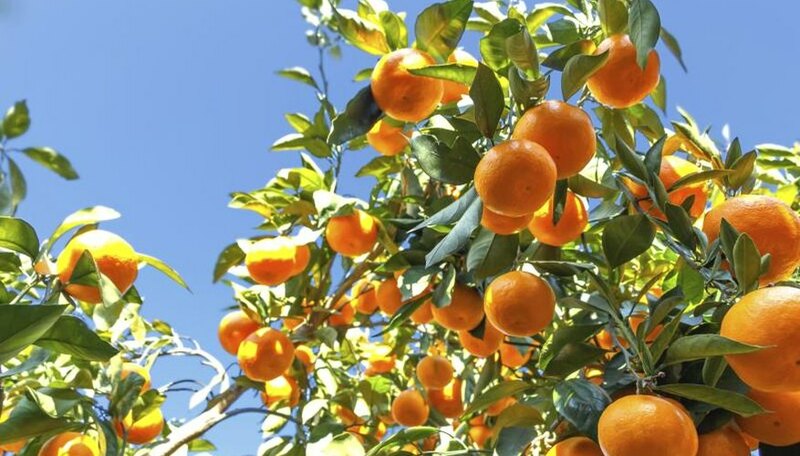 Orange trees quickly deplete the soil's nutrients. You’ll need to regularly fertilize your tree for it to properly mature and bear fruit. Work 1/2 cup of 8-8-8 fertilizer around a tree at planting in February. Apply 1 cup six weeks later and increase the rate by 1/2 cup every six weeks through October. Apply 4/5 to 1 1/2 pounds of 8-8-8 fertilizer five times the second year, 1 2/5 to 2 4/5 pounds the third year, 3 1/3 to 4 2/5 pounds the fourth year and 4 2/3 to 5 4/5 pounds the fifth year. Spread the fertilizer over the basin or root spread the first year. After that spread it as many feet beyond the edge of the limb spread as the age of tree. For trees 10 years and older spread it 10 feet beyond the edge of the canopy. Do not fertilize near or in contact with the trunk. To make measuring easier, know that 1 pound of mixed fertilizer will fill a 1-pint jar. Orange trees grow in U.S. Department of Agriculture plant hardiness zones 9 through 11. New growth on citrus trees may wilt at soil temperatures ranging from 48 to 62 degrees Fahrenheit. Orange tree roots grow well at air temperatures between 65 and 90 F but this stops at higher temperatures.